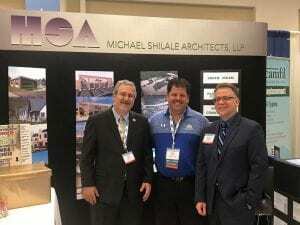 9/30/18: Michael Shilale Architects, LLP had the pleasure to attend the New York State School Facilities Association (NYSSFA) Conference and Expo in Saratoga Springs recently. We loved sharing some of our successful and creative Green Ideas with the dozens of School Directors of Facilities who stopped by our booth. This year was special for us as our longtime client and friend Paul Rooney was elevated to President of the Association. We congratulation Paul on this well-deserved honor that recognized his expertise and years of contribution to making public schools safer, healthier and better places for students, teachers, and staff. Wishing to continue this legacy of communication and good repour with all those attending, Michael Shilale Architects held their annual Library Grant prize for one lucky school district. And the winner this year was – Mr. Thomas Scott with the Enlarged City School District! Congratulations to this year’s winner and all those to come!